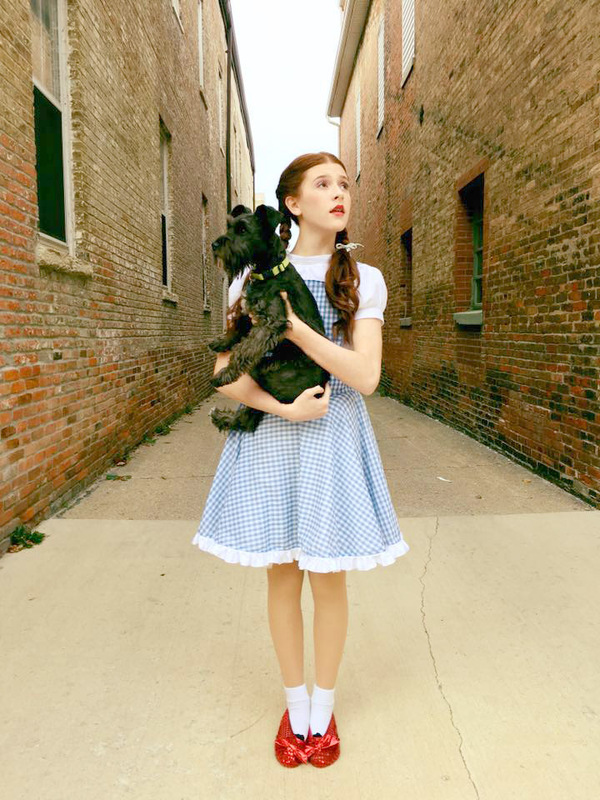 MODKIDBOUTIQUE: There’s no place like home! 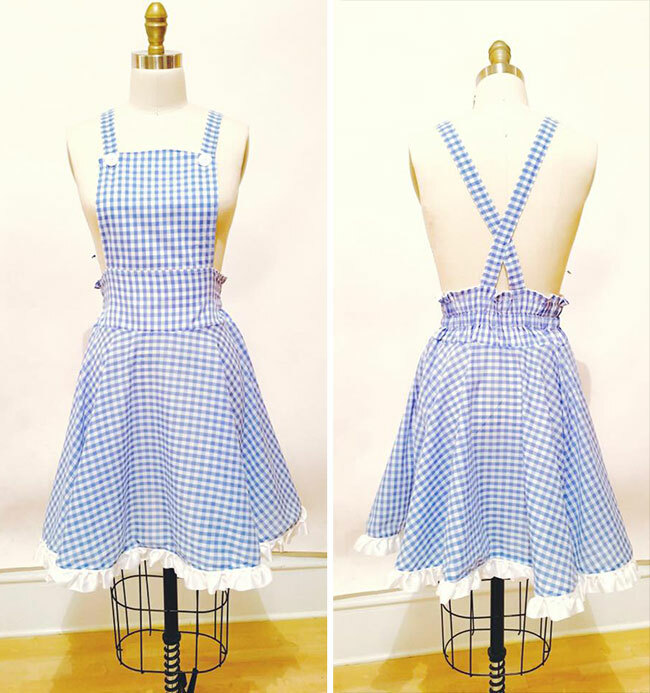 I had literally 3 days to make something, including finding all the right fabrics and accessories. Luckily, JoAnns had the perfect blue check for the dress and solid white for the shirt. I found some inexpensive shoe covers ($6.99) at Party City that slipped right over her ballet flats, and the blue ribbons for her hair I found in my own stash. But, I still had to figure out how to make the costume. 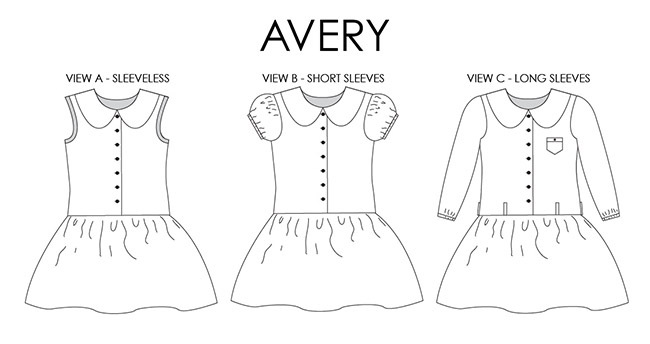 I used my own Avery pattern (available in both PDF and paper formats) View B for the shirt. Yes, this pattern comes only up to size 10, so I had to grade it up to a 14. Since the dress style is drop-waist, the length of the bodice was actually perfect length for a shirt. I wanted it to close at the back, to make it more authentic, so luckily Courtney had recently shared a tutorial for how to do a back closure on the Avery... perfect! 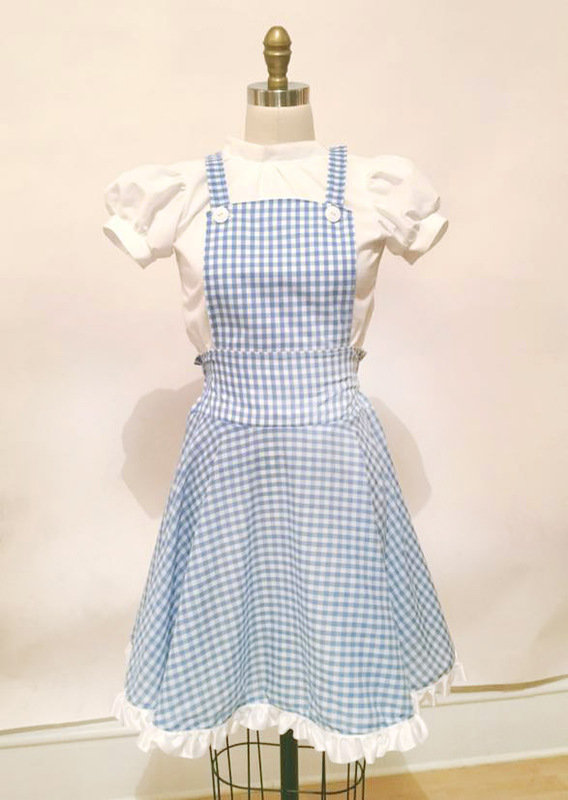 The only other modifications I made to it was to add sleeve cuffs instead of elastic to the bubble sleeves and add a straight neck band instead of the Peter Pan collar to the bodice. Both of those were super easy mods! The dress was another story. I was running out of time and didn’t have time to research patterns for it. So, I just made a circle skirt based on Sophie’s measurements. I took her hip measurement and found out the radius to cut the inner circle opening. From there, I measured her desired skirt length (19”) and cut. I didn’t have to add hem allowance because I knew I would end up adding a ruffled ribbon trim at the hem. Then I cut a rectangular piece for the bib (with its corresponding lining), a waistband piece and two suspender pieces. I sewed everything together and made two casings in the back waistband where I inserted two pieces of 3/4” elastics cut to half her waist measurement. Done! 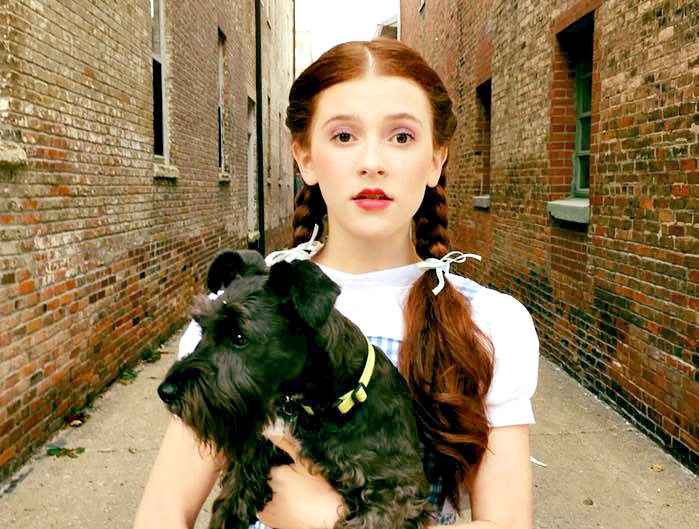 For the hair & make up, Sophie and I did a ton of reseacrh on how Dorothy (Judy Garland) did hers. Part hair down the middle and brush both sides until it is smooth. Divide each side into 3 equal sections, as if you were doing braids. Except the section closest to the face needs to twist, twist, twist tightly until it reaches behind the ear. At that point, begin braiding the twisted section with the other 2 sections of hair until you reach her shoulders. At the shoulders, wrap a hair tie around the hair to keep the braids from coming undone. Use a curling iron to curl the remainder of her hair below the shoulders. Cover the hair ties with a light blue ribbon tied into a pretty bow. Begin by covering the face with a light colored foundation and powder to achieve that smooth porcelain skin look. Apply pink blush to the cheek bones. Apply dark pink or red lipstick. Apply mascara to open up her eyes more. 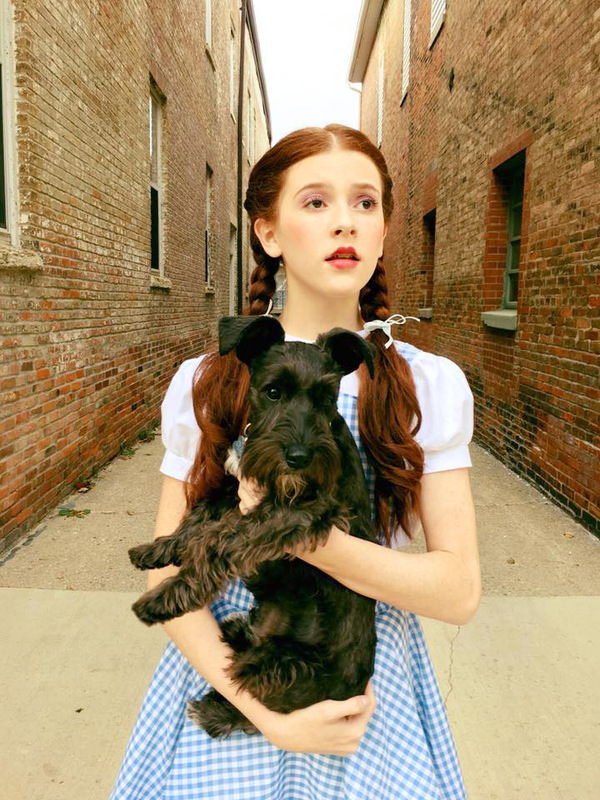 Now, all we needed was the prefect TOTO. 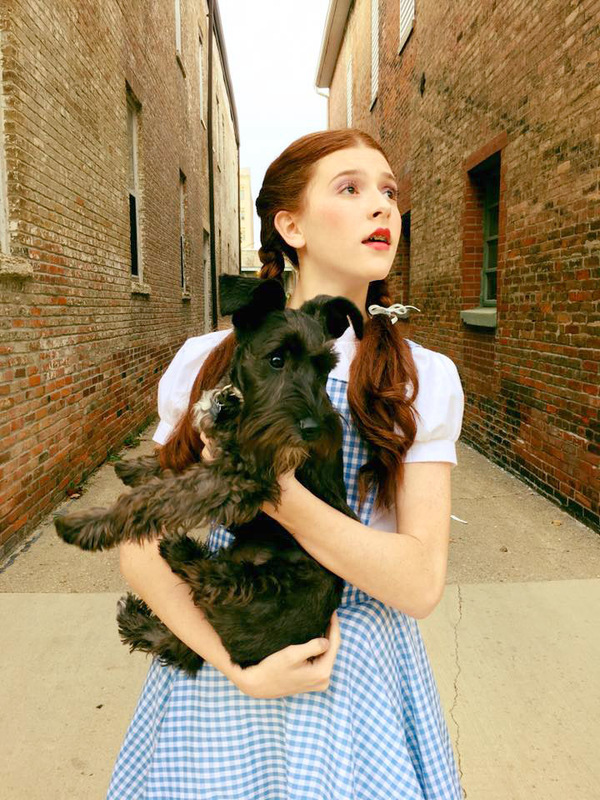 Luckily, we had our Miniature Schnauzer, Duke, who fit the part and was more than eager to help out with the photoshoot. You are just so creative being able to adapt and adjust what you already have and know. Thanks for sharing your process, as it makes it easier for the rest of us to follow along and adapt what we have and know! 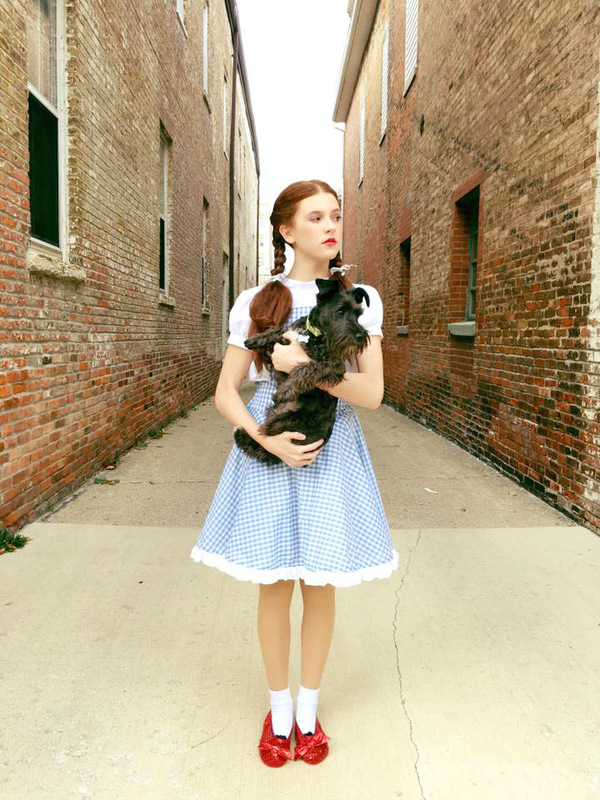 Amazing job with the costume, hair, make-up, styling and photography! So amazing!!! Wow, what a change! This is such a great reproduction!